DEMOTTE, Ind. 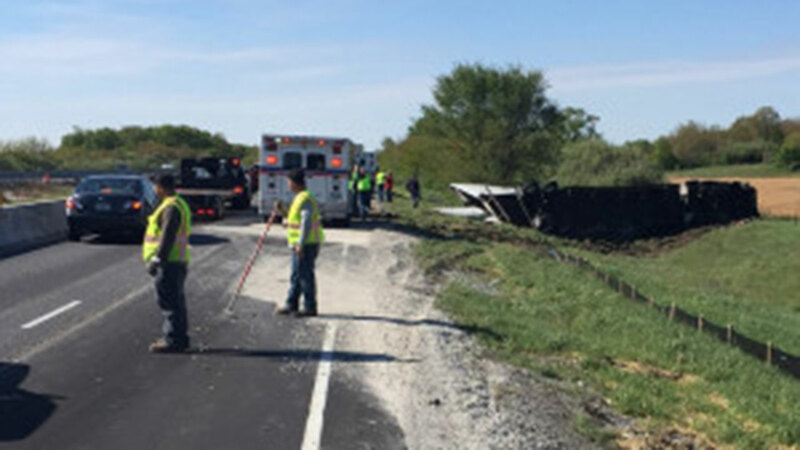 (WLS) -- A 51-year-old Arlington Heights man was charged Monday with drunken driving after he rolled over his semi-truck on Interstate 65 in northwest Indiana, closing southbound lanes for at least six hours. Shortly before 9 a.m. Monday, Oleh Halatyma was driving a tractor-trailer loaded with 20,000 pounds of powdered milk and a fork-truck in a construction zone, according to the Indiana State Police. Near 226.8 mile marker, Halatyma drove into the right guardrail, causing the front right tire to deflate. He then side-swiped the outer concrete bridge before it drove off the shoulder. The truck overturned and landed in a west ditch, police said. The incident occurred about three miles south of the State Route 10 exit near DeMotte in Jasper County. All lanes reopened by 3 p.m., however continued delays were expected throughout the evening rush hour. Halatyma was charged with drunken driving, disregarding a traffic control device and unsafe lane movement. He was held in custody at the Jasper County Jail. The truck was operating under the authority of Sunrise Highway LLC in Wheeling.